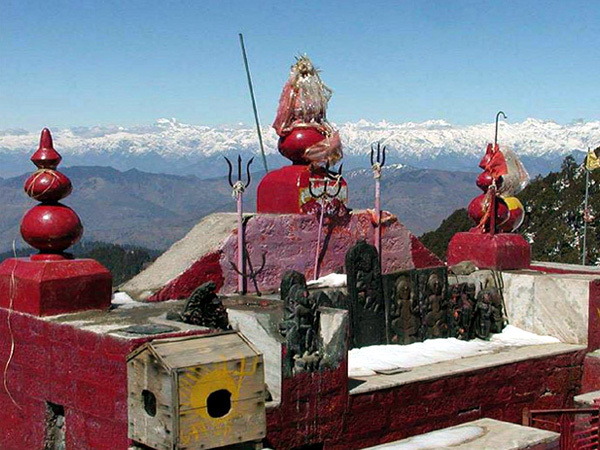 Shikari Devi temple is near to Karsog Valley in the Himalayas in Distt mandi Of Himachal Pradesh with beautiful view of pine, deodar woods and apple orchards.The Shikari Devi Temple is positioned at a height of 2850 meters above sea level in the state of Himachal Pradesh. It is extremely difficult to trek up to the Shikari Devi Temple from Janjheli,Bagsaid,Kandha or Karsog Valley.You can enjoy a beautiful trip with different routes to reach upto ancient shrine of the Shikari Devi Temple located at the peak of the hill. According to old saying/legends that the hunters or Shikari in the early years once worshipped the Goddess on the mountain asking for success in their hunt. So in old days Goddess was known as Devi (Goddess) of Shikari (Hunter) means Shikari Devi. This old temple and Goddess is believed to be in existence from the time of the Pandavas. According to the myth, there will be no snowfall on the top of Temple and snow never stay there. 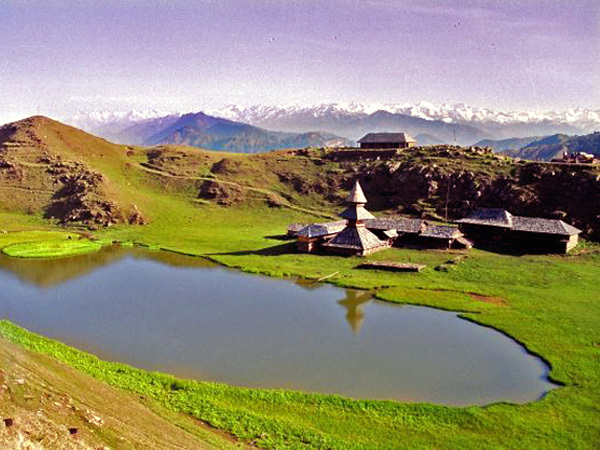 Located on a mountain spur, an hour's drive from Mandi brings you to this jewel like lake. With water, woodland and high hills, it presents a variety of natural beauty and the spot is sacred for Hindus, Buddhists and Sikhs. It was here that the great Indian teacher and tantric, Padmasambhava left for Tibet. Known to the Tibetans as Guru Rinpoche - the Precious Master. It was under Padmasambhava's influence that Mahayana Buddhism spread over Tibet. There are islands of floating reed on Rewalsar Lake and the spirit of Padmasambhava is said to reside in them. It is here that the sage Lomas did penance in devotion to Lord Shiva, and the Sikh Guru Gobind Singh also resided here for one month. ACCESS Rewalsar is 24 km by road from Mandi. Taxis and buses are available at Mandi. CLIMATE In winter, the temperature can hover around freezing point when heavy woolens are required. During summer, the climate is mild and light woolens/cottons are recommended. The place as a whole is quite peaceful.There are lots of scenic beauties to see like sunset across the lake,valley view from the road going to Karane etc. There are two open big grounds in the colony where a lot of children play, people usually go for a walk in the evenings and mornings,usually on the roads towards nearby villages like Chambi and Kerane. Mahamaya Temple: Located on top of a hill, offers a panoramic view of the city and is one of the most sacred places around. Parasara is a Rig Vedic Maharishi and author of many ancient Indian texts. Parasara (or Parashar) was the grandson of Vashista, the son of Sakti Maharsi, and the father of Vyasa. There are several texts which give reference to Parasara as an author/speaker. Modern scholars believe that there were many individuals who used this name throughout time whereas others assert that the same Parasara taught these various texts and the time of writing them varied. Situated at a height of 1835 Mtrs. 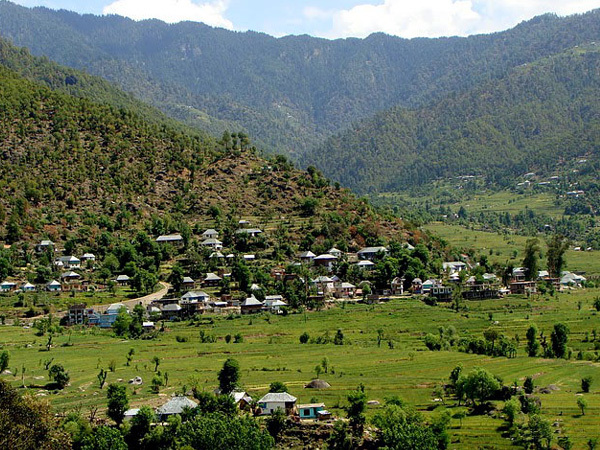 Barot is a beautiful place on the bank of river Uhl. It is famous for its Trout Fish Farm being operated by Fisheries department. 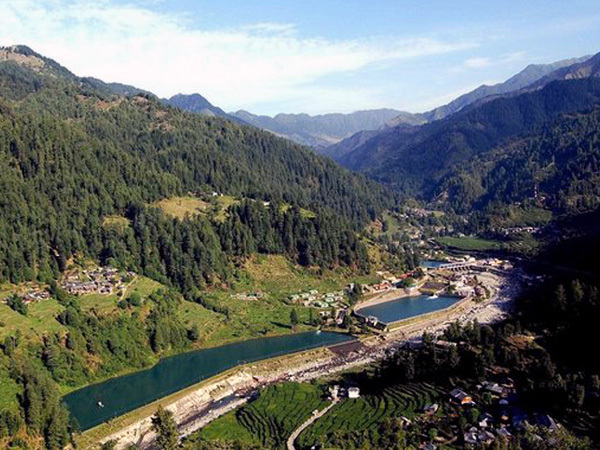 The reservoir of Shanan power project built by Britishers is located here and adds to the scenic beauty of Barot. Barot is also the Gateway to the Nargu Wild life Sanctuary spread over area of 278 sq. kms. which is the home of Monal, Wild Cats, Monkeys and the Black Bear. On the way to Barot, at 5 Km from Ghatasani, Jhatingri is situated. It is covered with thick Deodar trees from all sides. Once, it was the summer capital of Mandi. There are many other places of interest in Chauhar Valley like Himri Ganga for holy bath, Hurang famous for its Kahika Fair, Dev Dhank near Tikkan, Ghoghardhar and Dyana Park. 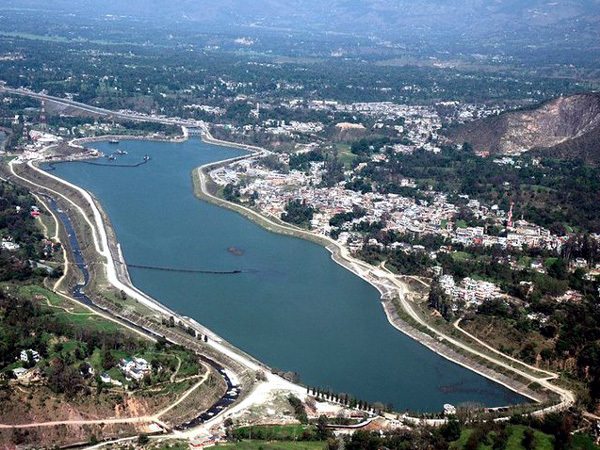 The picturesque Janjehli is situated at an elevation of 2150 Mtrs. The places is a lush green valley with agricultural fields in gentle slopes, apple orchards, hills covered with pine and deodar trees and a small rivers having crystal clear water moving like a snake through various criss-cross hills. Janjehli is loved by trekkers and nature lovers alike. 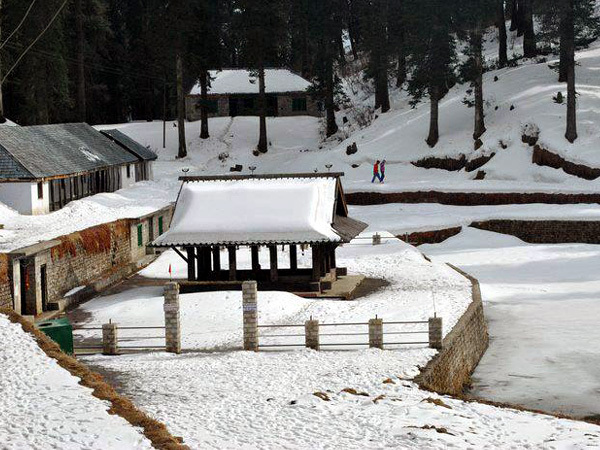 This valley, adorned by snow during winters, is no less than heaven on the earth. The art lovers must have glimpses of traditional wood carving and metal work. Situated at a height of 3,334 Mtrs. 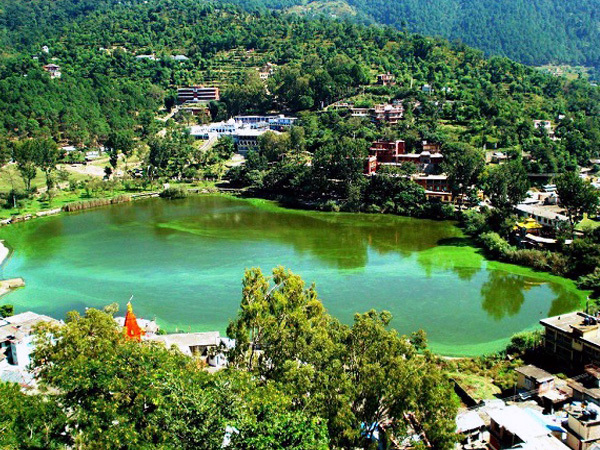 Kamrunag is known for the lake and the temple besides the lake. View of Dhauladhar Range and Balh Valley adds to the scenic beauty of the spot where the lake and pent roof temple of Dev Kamrunag exist surrounded by thick forests of deodar. As per tradition, Kamrunag is the King Yaksha of Mahabharata and worshiped by Pandavas. There is a tradition of offering gold, silver and coins in the lake by devotees on the fulfillment of their wishes by Dev Kamrunag. For nature lovers, visit to Kamrunag is visit to paradise. MONASTERIES : At opposite ends of the lake there are two Tibetans monasteries. The Bhutanese also have one. GURUDWARA : This Gurudwara was built in 1930 by Raja Joginder Sen of Mandi. It commemorates Guru Gobind Singh's visit, when he sought to evolve a common strategy with the hill rulers against the Mughal emperor Aurangzeb. TEMPLE : At Rewalsar there are three Hindu temples. These are dedicated to the sage Lomas, Lord Krishna and Lord Shiva. MINI ZOO : The forest department maintains a small zoo at Rewalsar. Above Rewalsar, Seven Lakes are also of interest.